on your hard disk, on network drives or in the Cloud. Tabbles are special containers that you can use to organize your files, documents, emails, and Internet addresses. You can then use tabbles to find, sort and share your data in a totally new way. Compatible with: Vista, 7, 8, 8.1, 10. For LAN mode, it requires Microsoft Sql Server Express 2008 or above. You can finally add comments to files (or folders). you can actually write and edit multiple comments on each file – each comment will shows when it was written or modified. If you’re working in a multi-user environment, you can see who wrote what and when, making it look pretty much look like a chat. A bit like slack or Google Wave. 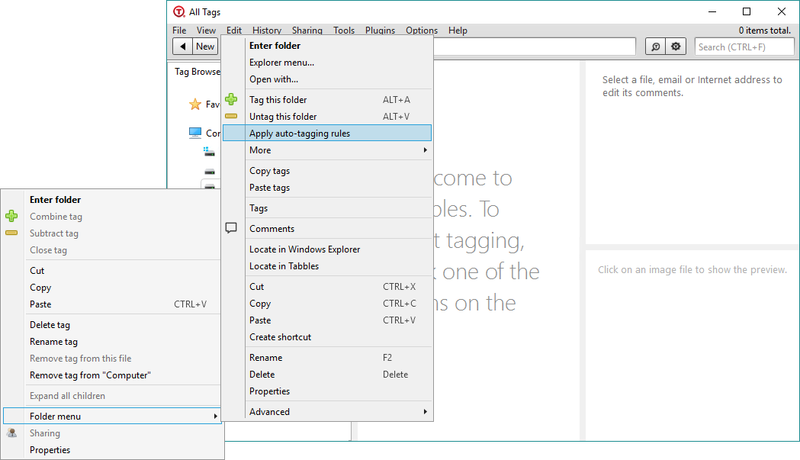 This first build of Tabbles 5 features an extension of the auto-tagging rules that will allow you to search “inside” a file ( search the content of a file or document). When Tabbles files a file contains the keyword, the file is automatically tagged based on the rule(s) you set up. To achieve we’re using the awesome Tika library, the full list of files we can extract text from is here. 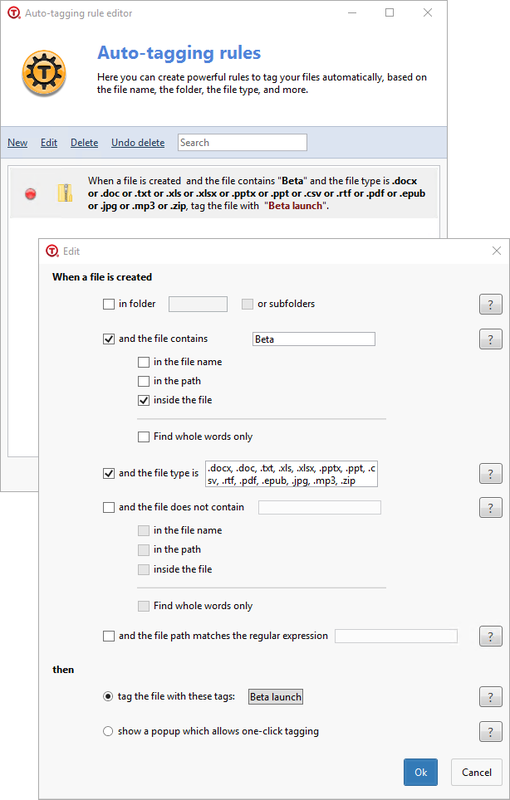 Automatically tag any new file (document) you create, that contain a certain word. Every time a file is created that contains a certain word, get a pop-up to notify. Use Tabbles as data-mining tool: let it go through your hard-drives (local, shared on cloud ones), let it find files with important information and automatically categorize it for you. Once you set one or more auto-tagging rules, targeting file content, you can then tell Tabbles: “now go and look through this whole disk and find any file that matches any rule”. You do it by right-clicking on a folder (disk) and clicking on Apply auto-tagging rules. Note: if you start from a disk in the left-pane tree, you will need to do: Right-click > Folder menu > Apply auto-tagging rules . 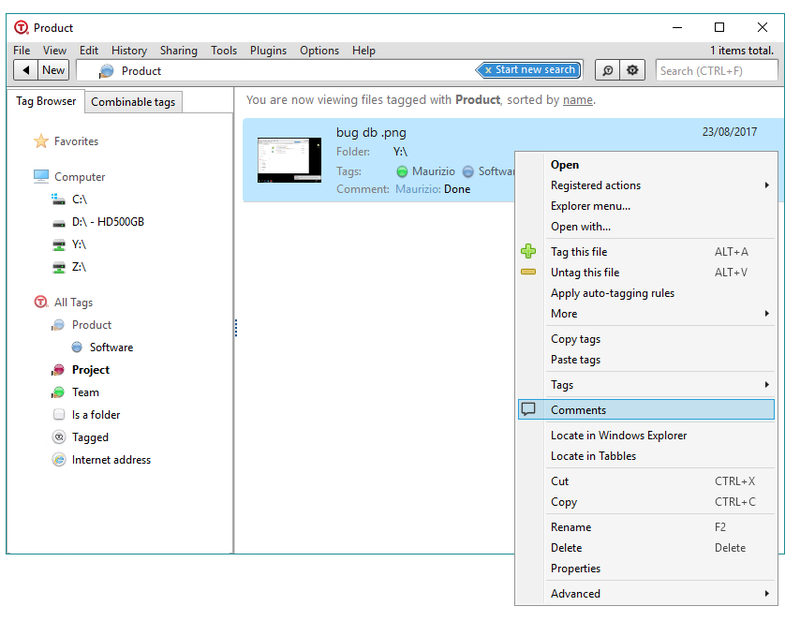 Tabbles unifies the concepts of file tag and virtual folder: users find files by navigating concepts (not folders). It builds a layer on top of the file system (it does NOT move/delete/copy files or folders), it saves tagging data in its custom internal database and shares it using shared folders (works fine with cloud storage services). It’s a desktop app: drag’n’drop, copy’n’paste, keyboard shortcuts work as they should. Windows explorer: it only allows you to store files into regular (hierarchical) folders. Google desktop: it reads through files and tries and guess what they’re about. 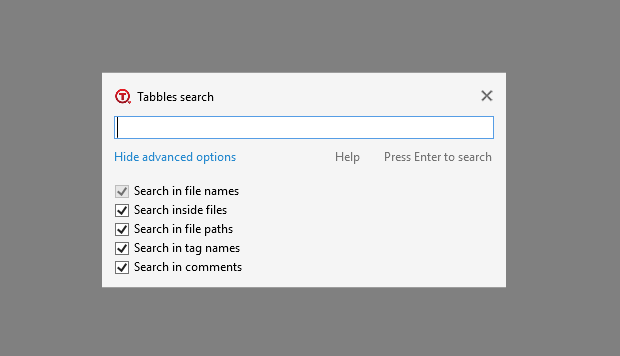 Tabbles works with user-given input, therefore the results of search are much more precise. Windows 7 Libraries: they allow the user to group and show the content of several folders at once. 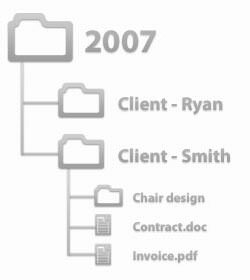 Tabbles creates a virtual files which is unrelated to folders and user can combine “concepts” to see the data they have in common.